After the peace, the French decided to colonise the "Isles Malouines" ( Falkland Islands). These islands were at that time almost unknown. At his own expense, Bougainville undertook the task of resettling Acadians who had been deported to France by the British because of their refusal to sign loyalty oaths. 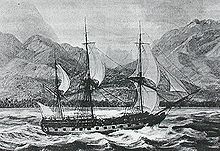 Although the French colony did not number more than 150 people, for financial motivations (Bougainville having paid for the expeditions) and diplomatic reasons (Spain feared that the Falklands would become a rear base to attack her Peruvian gold), Bougainville was ordered by the French government to dismantle his colony and sell it to the Spanish. Bougainville received 200,000 francs in Paris and an additional 500,000 francs in Buenos Aires. Spain agreed to maintain the colony in Port Louis, thus preventing Britain from claiming title to the islands. Spain had claimed dominion before the French settlement in association with its colonies on the mainland. On 31 January 1767 at Río de la Plata, Bougainville met Don Felipe Ruiz Puente, commanding the frigate La Esmeralda and La Liebre ("the Hare") and future governor of Islas Malvinas, to transfer possession and evacuate the French population. His expedition left Tahiti and sailed westward to southern Samoa and the New Hebrides, then on sighting Espiritu Santo turned west still looking for the Southern Continent. On 4 June he almost ran into heavy breakers and had to change course to the north and east. He had almost found the Great Barrier Reef. He sailed through what is now known as the Solomon Islands but, because of the hostility of the people there, avoided landing. He named Bougainville Island for himself. [ citation needed] The expedition was attacked by people from New Ireland so the French expedition made for the Moluccas. At Batavia, they received news of Wallis and Carteret who had preceded Bougainville in discovering Tahiti. Bougainville's name is given to the largest eastern island of Papua New Guinea; and to the strait which divides it from the island of Choiseul. It is also applied to the strait between Mallicollo and Espiritu Santo islands of the New Hebrides group. In the Falklands, Port Louis, and " Isla Bougainville" (Lively Island's Spanish name) commemorate him.